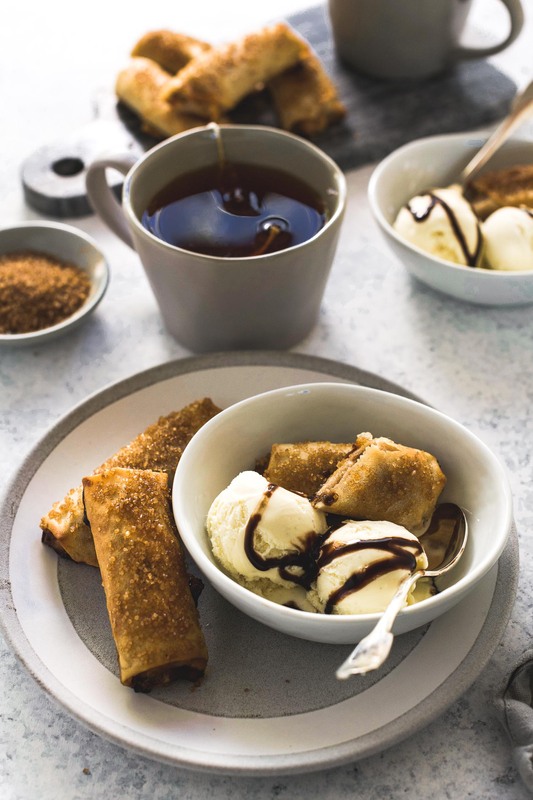 Merienda, a late morning or afternoon snack, is a Philippine tradition and Turon is a popular snack time treat. 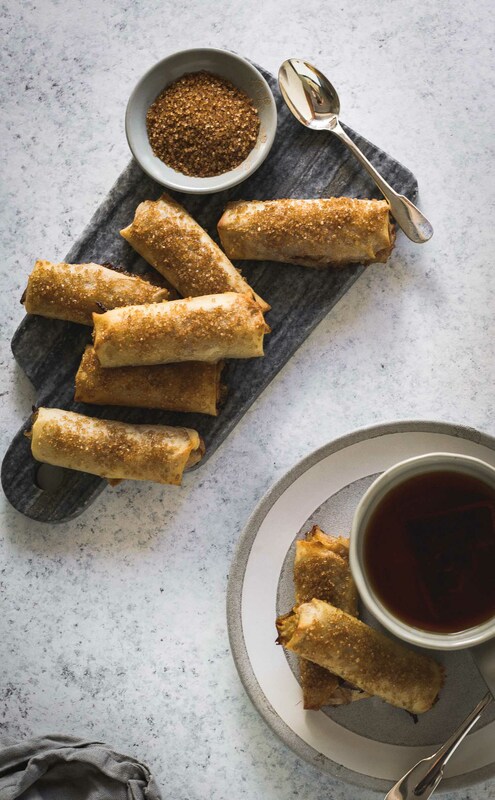 My version of the classic banana spring roll is baked so you can enjoy all the goodness without the deep-fried guilt. 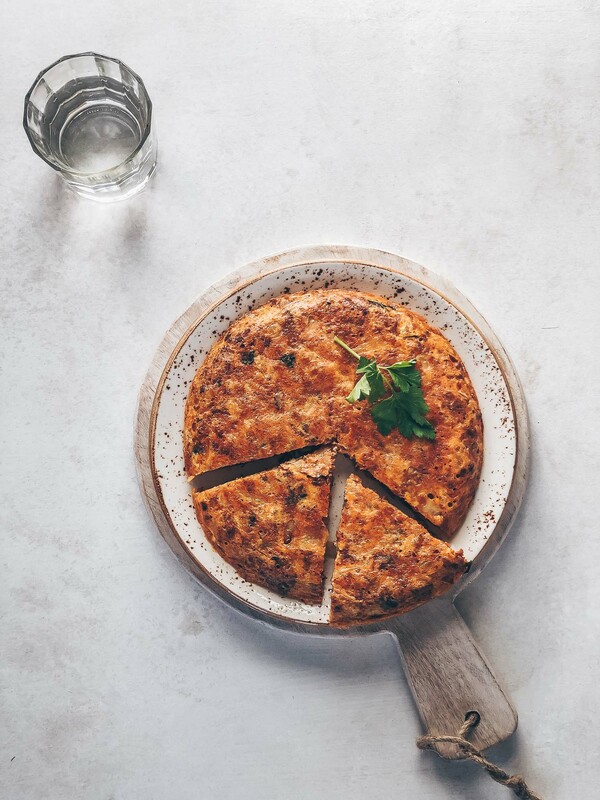 Merienda, Meryenda, Marenda, Merenda…if your family hails from Spain, Portugal, Italy, Croatia, anywhere in Latin America or the Philippines you will recognize these terms to mean one thing: snack. And it wouldn’t matter if you had–the host would hear none of it. Your tita or lola would try to feed you anyway…most likely offering whatever merienda items she has recently prepared. As a child I remember being spoiled for choice when it came to merienda options. Whim dictated whether I’d lean savory–empanadas, noodles–or sweet but turon was a consistent favorite. While I enjoy fried food I avoid it at home so I’ve learned to bake this merienda treat. 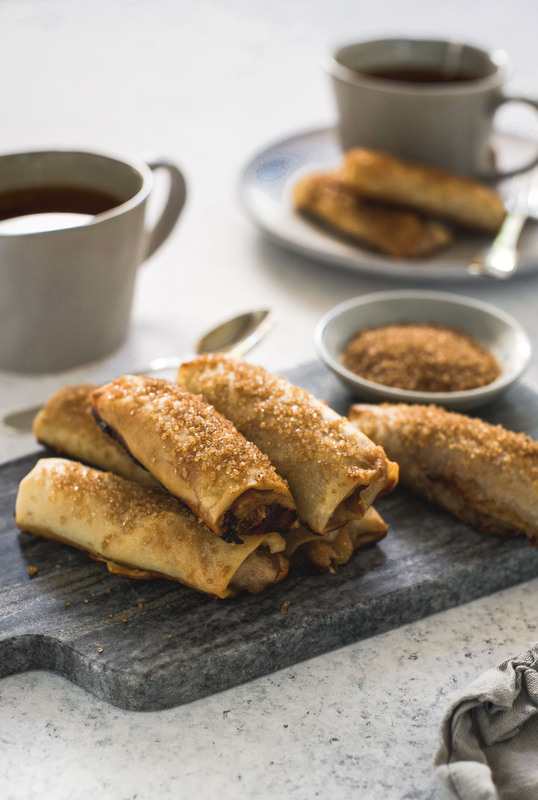 What’s great is that with just a couple of simple adjustments I’ve been able to get crispy, flaky turon without the deep friend mess (or guilt). What works for me is to use a very thin lumpia wrapper and I preheat the baking sheet to make sure the turon bakes completely and evenly. I get the same golden color and texture with only one pan to clean up later. Another great thing about turon is how flexible it is. 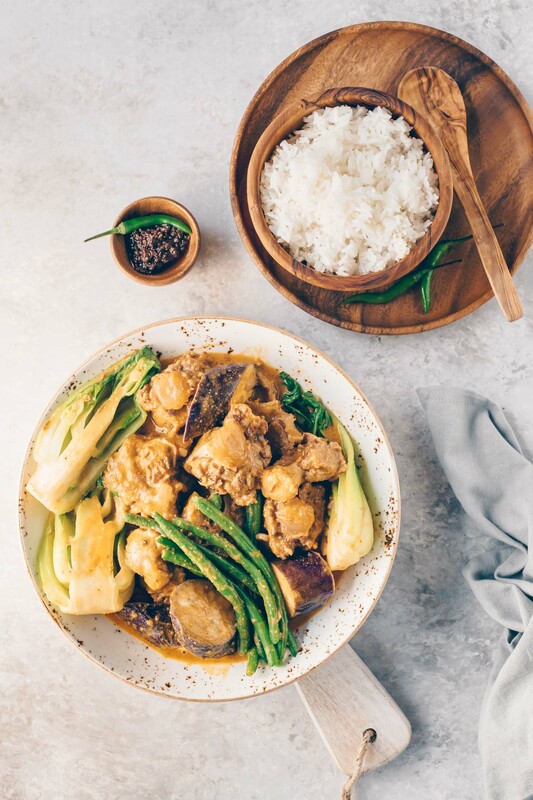 You can break with Filipino tradition and make it your own. Instead of brown sugar I roll the banana pieces in cinnamon sugar for just a hint of spice. 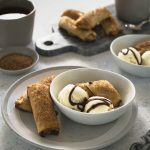 My husband prefers the ones I bake loaded with chocolate chips and, as pictured here, these sweet spring rolls are perfect served a la mode and drizzled with chocolate or caramel sauce. You can’t go wrong. Turon is a popular Philippine snack. 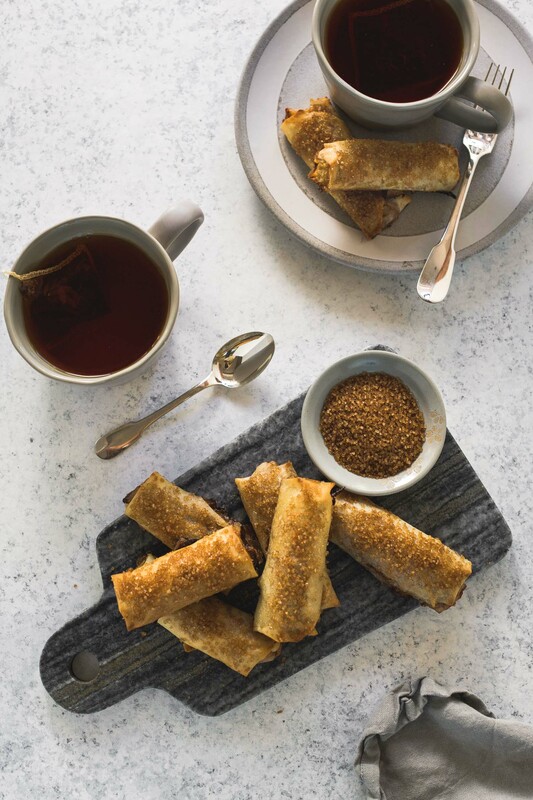 My version of the classic banana spring roll is baked so you can enjoy the goodness without the deep-fried guilt. Preheat your oven to 400ºF (375º with convection). Line a baking tray with nonstick foil and put it in the oven to preheat. Peel the bananas and quarter them. 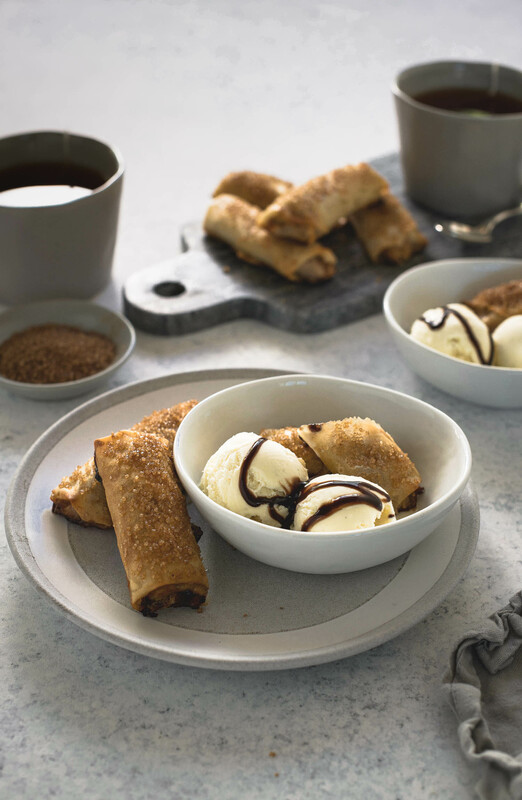 Dip each quartered piece in the cinnamon sugar mixture and lay at the center of one lumpia wrapper. One corner of the wrapper should be facing you; lay the banana piece horizontally and fold the corner closest to you over the banana. (If you wish, you can add chocolate chips on top of the banana.) 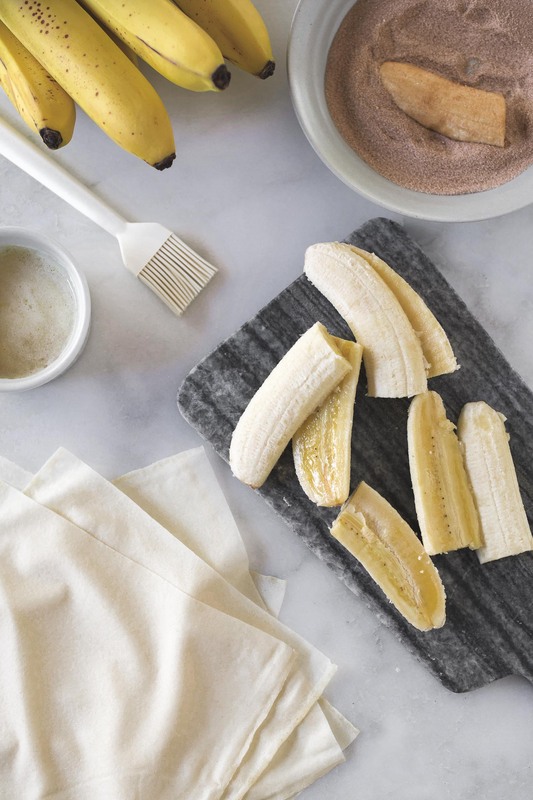 Fold the left and right corners in towards the banana and wrap tightly. When you get to the last fold, brush the ends with them melted butter and fold to seal. Repeat with the remaining ingredients. 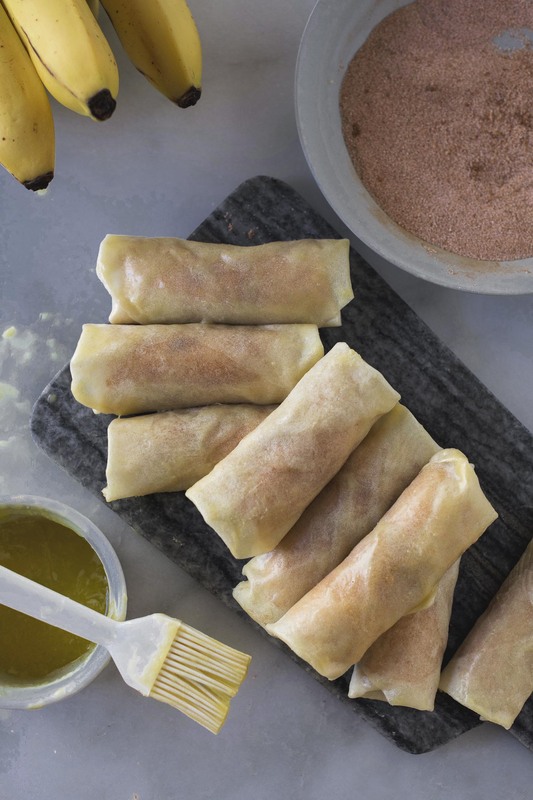 When the oven and baking tray have preheated, brush the entire surface of the banana spring rolls with the melted butter and arrange them on the baking tray. Don't pack them too closely to allow air to pass through between the rolls so they crisp up. 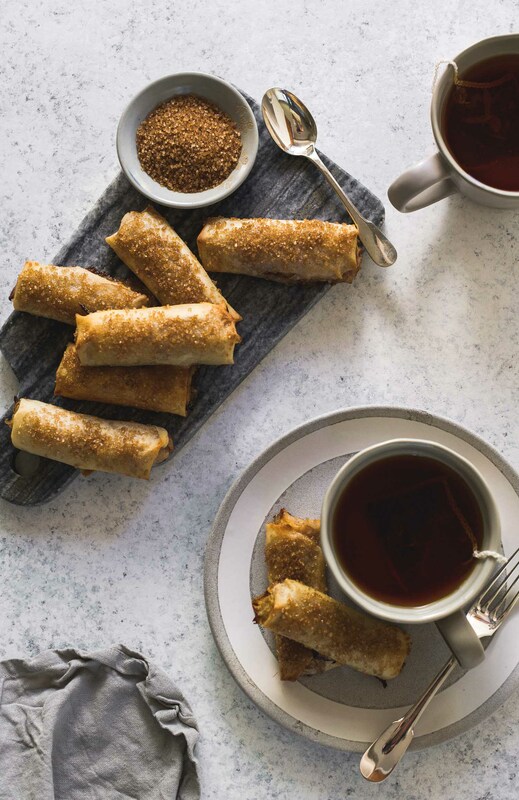 Sprinkle the turbinado sugar on top of the spring rolls before baking. This step is optional but adds more crunch to the rolls. Bake the turon for roughly 27 minutes, rotating the pan halfway through the baking time. Pull them out of the oven when they're nice and golden. Cool for a couple of minutes and enjoy. These are great on their own or can be served with ice cream and/or chocolate/caramel sauce as in my pictures. Cinnamon Sugar: I use Penzey's Cinnamon and it tends to be stronger than other brands so adjust the cinnamon sugar to your liking. You may need less sugar in your mix. I am sure these must taste amazing and I like the addition of cinnamon! Am saving it to try. My little fella will love it.